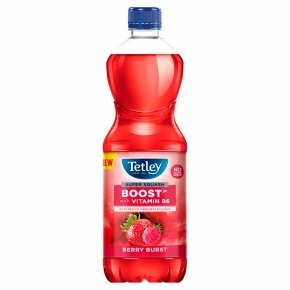 A reinvigorating burst of berry flavours with Vitamin B6 to help reduce tiredness and fatigue. Introducing our new Super Squash range - tasty squash enriched with vitamins! Our master infusers have cleverly combined real fruit juice with vitamin B6 to help reduce tiredness and fatigue. All that, and with no added sugar, it's Seriously Super Squash! Vitamin B6 contributes towards the reduction of tiredness and fatigue and contributes to normal energy-yielding metabolism. Directions of use: Dilute 1 part (50ml) concentrate with 4 parts (200ml) water to give a refreshingly delicious and healthy drink.